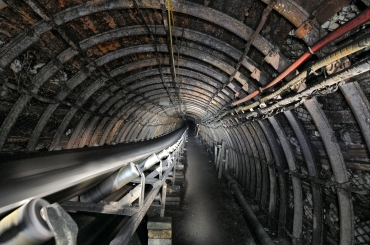 Fabric-rubber conveyor belts, 1-ply, flame-resistant PWG GTP, are designed for transportation of loose materials in underground pits of mining companies extracting combustible minerals (e.g. coal) and non-combustible minerals (e.g. ore, salt, aggregates). They are characterised by highly persistent fabric core and highly durable mechanical connections. The belts are made of a monoply fabric uniformly woven (solid woven) and rubber covers. The ply made of polyester blended with cotton in a longitudinal direction of the belt and polyamide mixed with cotton in the transverse direction (EBPB) is soaked with a special blend of poly (vinyl chloride) (PVC). The properties of used materials allow the GTP PWG belts to meet high physicomechanical requirements for electrical – fire safety. Flame-resistant GTP PWG belts have the approvals of the State Mining Authority in Katowice for use in underground mines as well as appropriate approvals and certificates required on foreign markets.